Emirates Airlines, the exclusive sponsor of the UAE Rugby Federation and sponsor of the Men’s, Women’s and Under 20’s National 7’s and 15’s teams have renewed their commitment to Dubai Rugby for another five years. Reinforcing its commitment to rugby in the UAE, Emirates Airline has renewed its sponsorship agreement with the UAE Rugby Federation (UAERF). Through the agreement Emirates will continue as the Federation’s Exclusive / Official Airline sponsor and sponsor of the Men’s, Women’s and Under 20’s National 7’s and 15’s teams. The agreement will span five years and will see the Emirates logo proudly displayed on players’ shirts across the respective leagues. Qais Al Dhalai, Secretary General UAE Rugby said “Our National Teams are ambassadors of UAE rugby on the international stage and we are acutely aware of the abilities needed by our representative teams to compete at this higher level.” “We are very proud to have the commitment from Emirates for another five year term, which will assist us in our goal of bettering our standing in Asia Rugby rankings, and to bring to UAE residents the enjoyment of watching more competitive games”. UAE Rugby Emirates Airline Men’s XV team recently competed in and won Asia Rugby’s Asia Rugby Championship (ARC) Division 2, which sees the team promoted to Division 1 as well as be eligible to compete in the 2019 Rugby World Cup qualifying rounds. Emirates boasts a rich rugby heritage with its extensive portfolio of top-class rugby sponsorships, and the airline strives to reflect the core values of the game and enrich the experiences of rugby fans in the UAE and across the globe. Emirates has been the Official Airline of the UAE Rugby Federation since 2011. The airline has also been the Title Sponsor of the Emirates Airline Dubai Rugby Sevens for over 20 years and the vibrant tournament has firmly established itself as one of the best on the HSBC Sevens World Series circuit. While remaining extremely popular with the UAE western expatriate community, rugby has made impressive gains in promoting the game to the Emirati population, evident with the Federation’s recent inaugural Community League and the historic fielding of the first all-Emirati XV’s side. Speaking on the development of Emiratis into the XV’s format Al Dhalai commented “It is one of our (the Federation) strategic goals to have an all-Emirati UAE National test side by 2021. Emirates renewed sponsorship will assist us with realising this goal”. Desert Sport Strength & Conditioning (DSSC) are proud to launch their rugby strength & conditioning (S&C) programme across Dubai, delivering tailored coaching for local rugby clubs throughout the sporting year. DSSC is a unique concept brought to Dubai sport by a team of highly experienced, professional and passionate coaches, accomplished in sport, fitness & health and S&C. An opportunity has been recognised to support sport in Dubai, developing rugby teams with programming designed to maximise performance on the competitive field and avoid injury, something that has been prevalent during the 2015/16 season. DSSC is leading the industry as the only standalone institute to deliver a complete, holistic package of both S&C and health for players and teams. 3 training blocks – Strength, Hypertrophy, Plyometrics & Athletic Ability. Initial, mid & final testing to show clear progression. 27 sessions over 9 weeks on a 1:4 athlete:coach ratio, delivered by international standard coaches. Nutritional coaching on how to maximise both body composition and performance on the field, with consistent support to ensure dietary adherence. Educational support with articles & content shared among the group. Exciting extras, such as seminars with international rugby stars, coach visits and team trips. Mike Poole – Try scoring record holder for Newport, with playing careers in Newport Gwent Dragons, Scarlets and the Welsh International 7s team. Roan Kotze – Played professional rugby in South Africa before relocating to the Middle East to pursue a career in fitness & coaching. Jarred Lowson – Experienced 7s & 15s player in South Africa, Kenya & Dubai, DeFranco Certified Physical Preparation Specialist (CPPS) and Personal Trainer of the Year 2015. Max Physick – Experienced 15s player in the UK & Dubai, specialising in S&C, advanced body composition and hypertrophy strategies. With the launch of the DSSC Pre-Season Programme just around the corner, the coaches are excited to get local players on board and start developing their strength, speed, power and conditioning! Dubai Duty Free will continue as the official sponsor of the UAE Rugby Referees and all Match Officials through to the 2017/2018 UAE Rugby season. This support enables the UAE Rugby Referees to strengthen their standing as leaders within Asia Rugby through regional referee development and exchange programme. Dubai Duty Free, the world’s leading single airport retailer, has renewed its support of the UAE Rugby’s Referees Society for a further three-years through to, and including, the 2017/2018 season. The agreement names Dubai Duty Free as the Federation’s Official Sponsor of UAE Rugby Referees and Match Officials. As well as prominent positioning on the referees kit and working on UAE-based referee development, an important aspect of the sponsorship allows the UAE Rugby Referees Society to invest and position themselves as a training and development leader within Asia Rugby. An integral referee development programme is the Referee Development Weekend that took place earlier this year on January 21 through 23, in the UAE, where nine referees from neighbouring unions; Nepal, Sri Lanka, Jordan, Malaysia, China (2), India (2) and Uzbekistan, were hosted and where a core team of UAE Referees, consisting of Clare Shryane, Clare Daniels, Steve Leyshon and Stan Wright facilitated a three-day development programme on the fundamentals of rugby, assistant and tournament refereeing, fitness, working within a team and managing advice and input. Each of these components are designed to grow the referee/match official to being more effective and efficient at Union level while focusing on and working toward representation at international level, such as the World Rugby sanctioned Dubai Rugby 7’s tournament. “The Board are very proud of the commitment to the game and compliment our UAE Rugby Referees for their initiatives and leadership. UAE Rugby was very pleased with the attendance from our neighbouring unions at our recent programme, and it was shared that the facilitators saw quantifiable development, which will only benefit the way the game is overseen and played across Asia’s unions. We sincerely thank Dubai Duty Free for their ongoing support of our efforts in managing and officiating the game of rugby here and abroad” said UAE Rugby Secretary General Qais Al Dhalai. Dubai Duty Free’s support will see UAE Rugby’s Referees and Match Officials continue their development through attendance at regular IRB accredited workshops and courses, develop skills through officiating over West Asia Cross Borders rugby, as well as participate in and facilitate referee exchanges and development programmes. The Dubai Duty Free logo will have prominent positioning on the Referees and March Officials kit. UAE Rugby Federation’s Regional Development Officer, Ben van Rooyen has been appointed Asia Rugby’s ‘Get into Rugby Coordinator’ on a six-month secondment commencing May 1st, 2016. Van Rooyen’s primary task will be to oversee the implementation of World Rugby’s Get into Rugby (GiR) programme among Asia Rugby union members, working closely with these unions to ensure their GiR action plans are in place and conform to World Rugby guidelines. He will also oversee the integration of World Rugby’s ‘Impact Beyond’ programme which focuses on activating rugby-influenced activities in the lead-up to the 2019 Rugby World Cup, to be hosted in Japan. A highly successful programme across the globe, World Rugby’s Get into Rugby has been embraced by the UAERF since the federation’s inception (in 2011) and found the programme to be a valuable tool to grow the game in local communities that required established structures and pathways to grow the game. On Friday 26th February, 2016, the Dubai Sharks Rugby Club made history by fielding four competitive teams on the same day down at the Dubai Sports City ground. One unique game was between the Sharks 2nd XV and 3rd XV playing in the UAE Community League competition. 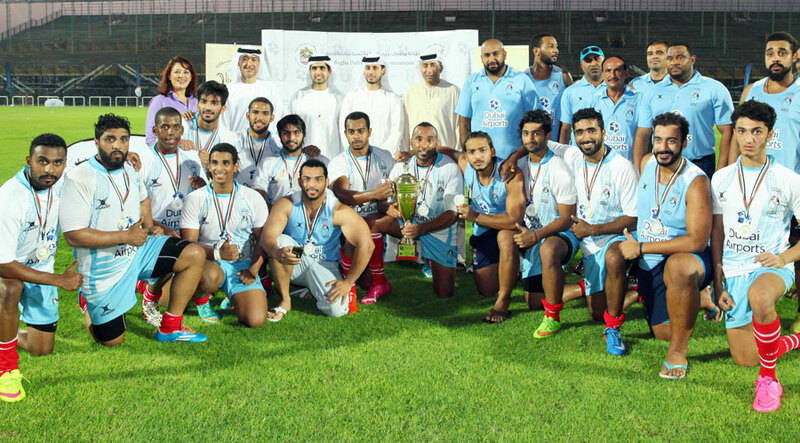 This was the first time that any Dubai Sharks teams had faced each other in a competitive 15-a-side game. The match itself was an extremely competitive game, with the 2nd’s using their younger players to great effect, running out 38 – 7 victors. The score line didn’t reflect the game as the first half was a tight fought contest with the Sharks 3rd XV scoring the first points of the game with a penalty try and keeping the 2nd XV deep in their half for most of the first 30 minutes. With fitness and youth on their site, and after a strong half time team talk, the 2nds returned to the field to display some great running rugby and scoring 4 tries within 15 minutes. Pictures of the game are available here. Another chapter written in the clubs history saw the first Sharks Ladies 15-a-side team take to the field, made up of Sharks and Hurricanes players. They played against a mixed Sharjah/Tigers side, with the Shark/Hurricanes ladies dominating the game, running out 36-17 winners. 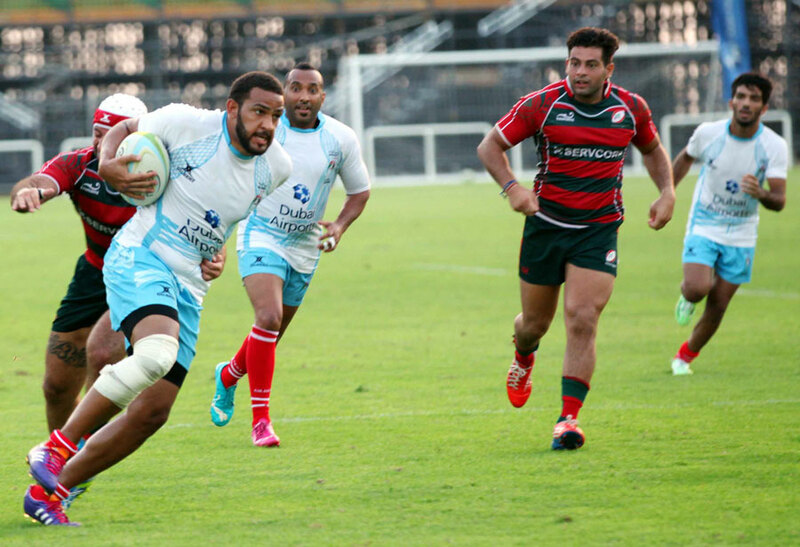 The Dubai Sharks 1st XV are chasing for a place in the UAE Conference League Plate Final. With two games played, losing the first game in hard fought battle against the Heartbeat Tigers, then winning a tough battle against their neighbours, the Arabian Knights. The Emirates Rugby and West Asia Rugby “West Asia Championship” 5th round will be played this Friday, Feb 12th, with matches scheduled across the Gulf; in Doha and Muscat, as well as Abu Dhabi and Dubai in the UAE. Current West Asia leaders Doha will play Bahrain in Doha at 15:00, Abu Dhabi Harlequins face Dubai Hurricanes in Abu Dhabi at 17:00, Abu Dhabi Saracens travel to Dubai’s Sevens ground to play Dubai Exiles at 17:00 and Muscat will host Al Ain Amblers at 17:00. All games are their respective local time. Additional to this weekend’s West Asia Championship games, the UAE Rugby Conference and UAE Community League games continue. The ceremony will be held at Arabian Ranches Golf Club on Friday, April 22, which are dedicated to youth aged between 13 and 19 as of September 1, 2015. Celebrating the excellent achievements of youngsters in the UAE as well as the dedication of all those coaches and parents who support them. The awards are open to all residents of the UAE and entries and are encouraged from schools, sports clubs, academies and teams as well as facilities, and the wider sports and fitness industry in the UAE. There will be 17 main categories of awards, which will be divided into different sporting disciplines. There are specific categories for UAE nationals, clubs and schools as well as the wider community. Entries for youth athletes, managers, coaches and teams will be divided into the following age groups: U14, U16, U19. Each entry will be judged by a knowledgeable and recognised panel of experts. The votes will be audited by professionals. Entries for submissions are open from January 15, 2016 and close on March 20, 2016. The shortlisted finalists will be revealed a month prior to the awards. YallaRugby had the honour of being invited to the a televised press conference held in The Ramada Hotel, in the presence of The UAE Rugby Secretary General – Qais Al Dhalai and Rashid Amiri, the Director General of Dubai Sports Channel with the following exciting news for that all UAE rugby fans will want to hear. UAE Rugby Federation (UAERF) and Dubai Sports Channel (DSC) have finalised a two-year agreement that will see a UAE Rugby Show produced and broadcast weekly, during the UAE Rugby season, on Dubai Media Incorporated’s Dubai Sports Channel. Scheduled for its first airing in February, the 30-minute show will offer highlights from the previous 2-weeks UAE Rugby Premiership, Conference and Community leagues, as well as regular spots focusing on Emirates Airline National Team performances, Emirati development (Dubai Airports Shaheen, and UAE Rugby’s Player Pathway Programme – co principal partners HSBC and Land Rover), a UAE-based club and player focus, referees updates, UAERF sponsor showcase, as well as other UAE Rugby related features. “This is another exciting first for UAE Rugby. We are thrilled to partner with Dubai Sports and bring to life the UAE Rugby Show where all expatriate and Emirati elements of the sport will be showcased” said Qais Al Dhalai, UAE Rugby’s Secretary General. “Our rugby community, from both the expatriate and the Emirati, is rich in interesting stories and we are exceptionally happy to have quality resources in which to create informative features. We are confident that the weekly show will be well received and supported by all and become an integral part of the wider UAE Rugby community’s week”. “We look forward to developing the show as we move through this season, and into the next” he added. The UAE Rugby Show will be broadcast in English and will offer Arabic subtitles, with it’s first airing on February the 1st 2016. We kick off 2016 with the West Asia Championship this Friday, January 8th, with 3 thrilling encounters to be played in Al Ain, Abu Dhabi and Dubai. Friday’s first game will see Al Ain Amblers play Doha at Al Ain Amblers home ground at 3pm, in the second game Dubai Exiles take on Muscat at Dubai’s Sevens Stadium at 3.30pm, and the final game of the day will see the Abu Dhabi Saracens against Bahrain at the Al Ghazal ground – 5pm. The West Asia Championship consists of the top 9 teams from across the GCC and will be played through to mid-March 2016. The top 9 teams, competing in the championship are; Al Ain Amblers, Abu Dhabi Harlequins, Abu Dhabi Saracens, Dubai Exiles, Dubai Hurricanes, Jebel Ali Dragons, Doha, Bahrain and Muscat. UAE Rugby’s Conference and Community leagues re-start next weekend, Friday January 15th. UAE Rugby’s Player Pathway Programme is set for an exciting 2016 with HSBC announcing they are to renew their support for a further 3 years, while Land Rover is unveiled as the programme’s co-principal partner (in a multi-year agreement). Today’s unveiling signals a continuation of support from HSBC and the addition of Land Rover to bolster UAE Rugby’s unique all-Emirati grass-roots rugby development programme. Launched in 2012 the UAE Rugby Player Pathway Programme (PPP) has enjoyed three successful years of bringing the game of rugby (following the World Rugby’s ‘Get into Rugby’ programme), overseen by three regional development officers, to over 30 National schools reaching over 6,800 Emirati children across Abu Dhabi, Al Ain and Dubai. Through the support of Land Rover and HSBC, UAE Rugby now have the opportunity to continue growing the programme in these Emirates while expanding into Northern Emirates where there is a significant opportunity for growth. Qais Al Dhalai, Secretary General UAE Rugby said, ”We are very grateful to HSBC for the support and commitment they have shown for the past three years and, collectively, we have been rewarded through the efforts of the programme by seeing a number of PPP players progress to the next development level – the Shaheen (an all-Emirati 7’s) Development Programme – and we are thrilled HSBC have renewed for another three-year term. We are extremely excited that Land Rover have chosen to align with UAE Rugby’s Emirati grass roots programme, as their combined support with HSBC allows us to grow the programme in existing Emirates and take the programme into the Northern Emirates and work toward our 2017 goal of 9,000 Emirati children actively playing rugby at school level, and subsequently increase the number of Emirati players moving through our development levels. I’m also very thankful to the Ministry of Education who has supported the PPP over the last three years and is committed to further enhance the programme with additional accesses to new variety of state schools for boys and girls across the UAE.“ added Al Dhalai. Land Rover has been at the heart of rugby, from the grassroots to the elite, for over two decades. We share the same passion, resolve and integrity that sits within the core of the game. Supporting the in-school programme, the UAE Rugby Player Pathway Programme conducts up to ten annual PPP rugby festivals, with the highlight being the National Schools tournament with eight Emirati schools competing, which is played on the Saturday of the annual Emirates Airline Dubai Rugby 7’s. With a combined playing number of 135, Jordan Rugby and Syria Rugby have put forward their strongest teams to challenge Emirates Airline Dubai Rugby 7’s Gulf Men’s Open title. Syria’s Damascus Zenobians, who tasted success in 2011’s Rugby 7’s claiming the plate, have beyond just a trophy to play for. In 2012 the union had over 80 players in their XV’s and 7’s roster, today that number is 35. The Zenobians will be intent on putting forward a performance that will build pride in the game amongst their countrymen. Jordan is enjoying solid growth in both the XV’s and 7’s format and can now count on over 100 players. Jordan’s domestic calendar boasts three leagues and the club with the most points, at the end of the season, wins the series. Their most recent 7’s series was exceptionally competitive where the top 3 clubs where separated by a mere 5 points. Winners of their recent 7’s series, Nomad’s, will be looking to capitalise on this recent form and bring a few surprises to the Gulf Men’s Open. Jordan’s 2 teams, Nomads Rugby Club and Citadel Rugby Football Club, will also be aiming to influence and inspire their future players through this weekend’s performance. Both unions continue to focus on providing the needed support to grow the game. 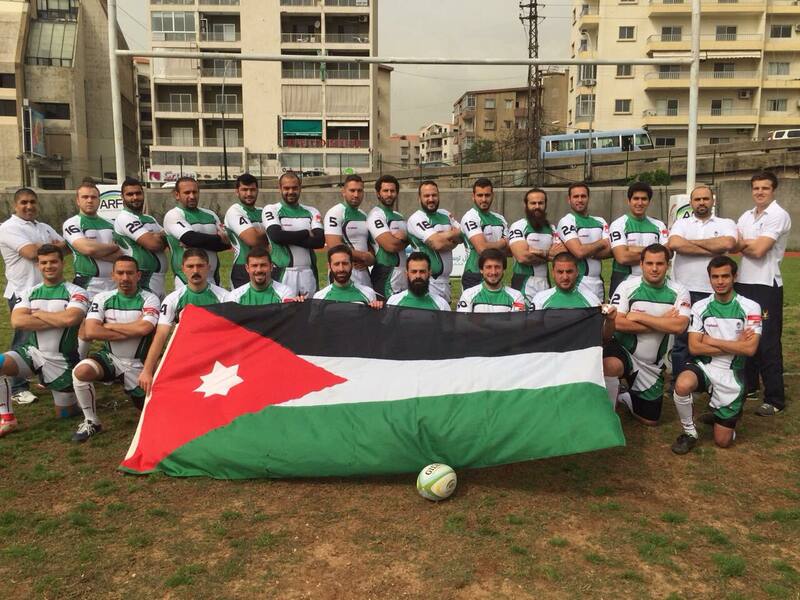 “Jordan’s Rugby Committee is working hard to develop Rugby across the Kingdom. We are working on developing the clubs starting with our youth. We have implemented World Rugby’s ‘Get Into Rugby’ programme in 10 schools (during 2015) and we currently see more than 500 players in the U18 category, our plan is to increase that number by 50% in 2016.” claim Jordan Rugby. Syrian High Rugby Committee was encouraged by being granted access to one of the best fields in Damascus, which is used for Syrian National teams (in Damascus). Asia Rugby West’s Rugby Development Consultant, Ghaith Jalajel said; “It is very pleasing to see an increase in number of teams representing West Asia countries in the Dubai 7’s. I know Jordan Rugby have enjoyed a very strong Domestic 7’s season, which encouraged players to play more rugby and now we have 2 teams representing Jordan, one team (Citadel Rugby Football Club) is made off all Jordanian players. There is a 3rd team representing Jordan in the Gulf Vets. Syria is the latest Asia Rugby members, and to me having a team from Syria represent everything rugby is all about. The will of the players to play and enjoy Rugby beats all difficulties they probably face in their country. We are taking this opportunity of having them in UAE to run training and education activities. We (Asia Rugby) held a Level 1 Coaching 15’s Course for them yesterday and we are planning a Level 1 Strength and Conditioning course on Sunday 6th (December) before they travel back to Damascus. I wish all involved the best of luck in the tournament and I am looking forward to working with them to further develop rugby in West Asia.” added Jalajel. Entered into the Bali 10’s Vets Cup, were a group of Potbelly Veterans, in a futile attempt to recapture their better days, set out for the magical island, in search of sun, sea and avoiding any need for additional hip replacements. As with all Potbellies Tours, events started with a charitable endeavour, visiting a coffee plantation and the local community, on the northern volcanic territory. Much was learnt, sports kit was donated and super charged civet coffee was appreciated by the weary travellers, who had assembled from the four corners. Our first warm up session, a bout of beach rugby, against a local mob of super charged, steroid popping, super human, U15 teenagers team — The Canggu Dogs / Bali Heat… Or at least that’s our excuse for getting our arses handed to us on the fine shores of Canggu Beach. A few of the touring party contemplated swimming off home. There was also a fitness warning shot fired across the bows very early on, where PB Quasimodo said he needed a “rest” after 42 seconds of play against the Dogs, which worried a few. Fortunately the arrival of local chilled Bingtangs ensured the Potbellies regrouped, re-energised, and provided a sublime lesson in rugby’s finer skills to the local rabble by basically forgetting the “touch” bit of the ‘Touch Rugby”. The only problem then appeared to be PB 30 Seconds, the focal point of our lineout effort, had obviously been at the donuts in preparation and solidarity for our upcoming game against the Malaysian Police Force. This in turn meant that he weighed marginally more than the Death Star to lift. So, The lineout wasn’t looking good, although your correspondent is pleased to record that our full-on 5 man, 480Kg scrum destroyed the 170Kg, 3 man effort of the U15s. In that sense at least, it was like men against boys. So the scrum was obviously looking good. We recovered and nursed injuries. 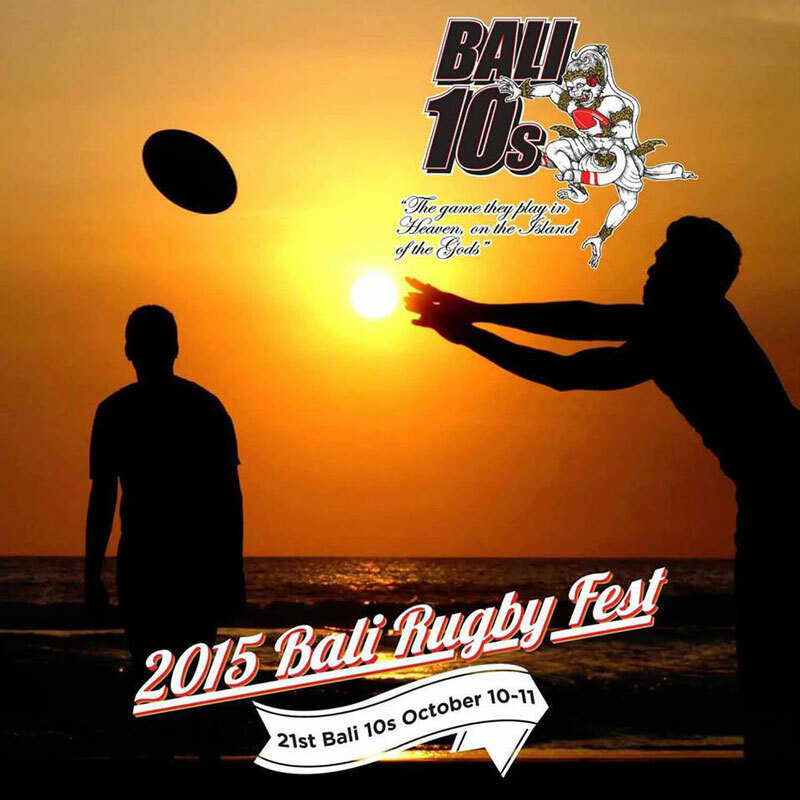 The Bali 10s Tournament kicks off. We had a mid-morning fixture against the Jakarta Dinos an outfit, most of whom looked surprisingly youthful for a Vets squad. After initially putting intense pressure on their line, they scored a breakaway try, a lead which was consolidated a few minutes later—probably after a lineout I imagine, where we had now resorted to using cranes and car jacks to lift PB 30 Seconds. … However, we were still competitive (line-outs aside), and after yet another break from PB George Michael, PB Invisible scored our only try of the game, a straight 12 minutes of combative 10 aside, to leave us losing the game 15 points to 5… not bad considering we were playing a bunch of 24 year old gym-junkies. Our second game, against a mining outfit from Aus / Indo , was more evenly matched, because at least they had read the rules on the “age policy for vets”. They did however have one player who was a 270Kg, 6’9″ tall miner and had obviously done time for GBH. PB Quasimodo, whilst on the burst, chose to run directly into said miner to discover what happened when an unstoppable force meets an immovable object. Lets just say everyone in the ground winced and the crash was heard in Perth. It was also in this game we first displayed the unique art of try line fever, although our lineout still wasn’t working. To be fair though, it wasn’t just PB 30 Seconds who was having a dodgy time at the lineout by now. In an often forgotten and overlooked move, PB Invisible interpreted the line out call to be “Fire the ball at top speed into the ample crack of PB Quasimodo’s arse” as opposed to the more traditional throw to the jumper (Darth again), who by some loophole in the laws of physics this time we had actually managed to lift. Ironically our try in the second game came from one of their lineouts, where PB Lord Lucan stole the ball off the GBH miner, who was subsequently flattened by PB Slip Slap Slop doing his Exocet missile impersonation, before PB George Michael’s and the back line’s wizardry created space for us to score via the wing in the far corner. Losing the game 10-5 was no shame in the end. With no more Vets fixtures for the day some of the squad, we shall refer to them as the deluded dementia sufferers, ran out for the Barbarians in the Open Cup. Limbs were lost in a bruising encounter against an efficient Perth outfit. Day five saw a very early start against Malaysia’s finest. The Police rugby squad. Many a Piggy trembled. Would the Officers identify them from Interpol’s latest Wanted Persons list? Caught by a sucker punch try almost directly from the kick off, while most of the piggies were still wiping the sleep from their eyes and really desperately hoping for the caffeine / brufen / paracetamol / an emergency shot of vodka to kick in. From the restart though you could see the effects of the various stimulants working, and the subsequent panic slowly starting to appear in the eyes of the opponents. like they’d been caught beating a confession out of a backpacker or something. PB 50 Shades continued his excellent half back work with PB George Michael, but this time choosing to showcase his brilliant banana kick from fly half, at one point managing to put the whole of our team offside, causing uncertainty in the Police ranks, who just threw the ball out for a lineout to us rather than score. The line out calls were now “Seriously, don’t worry about it. Just F* throw it in PB MMA”. Using such a tactic, it looked like we were disorganised, further disorientating and panicking our opposition. Finally, having camped on their line for a full 8 minutes, in a staggering example of white line fever / forward-play bloody mindedness, by ignoring both our full 5 man overlap and the roars of “pass it out FFS” from the unknowledgeable onlooking crowd (for fully 3 minutes), we finally bulldozed over for the equalising score with the last move of the game, proving, again, that piggy brawn is indeed sometimes better than brain. We can happily report, the game ended in a 5-5 draw, with no arrests and just a couple bruised ribs. With a five hour wait till our next game (!!!) several Potbellies were spotted surfing the waves off Jimbaran Beach, whilst others ran out for the Barbarians squad, picking up additional bruises as their only reward. The tour wrapped up in the evening by the partaking of many local ales, enjoying Irelands crushing defeat of the French Frogs. The UAE Rugby Federation (UAERF) has announced the dates for this years UAE Rugby Dubai Eden Park Sevens (7’s) Series. The popular tournament will spread over two Fridays; the first round on November 20th at the Dubai Sharks home ground at Dubai Sports, with the final round being played at Al Ain Amblers Rugby Club (Al Ain) on Friday November 27th. Alongside the action on the pitch, both Dubai Sports City and the Al Ain Rugby Club will host various fun, interactive competitions which will be open to all members of the family and where some fantastic Eden Park prizes can be won. Extensive food and beverage offerings will also be available adding to what will be two enjoyable days out. “We encourage, and look forward to all rugby supporters joining us for what will be 2 great days of domestic 7’s rugby” added Mohamed Shaker, UAERF Board Member. Both days’ fixtures are expected to start mid-morning and spectator entry to each tournament is free. We interview Baptiste Liagre, a new member of the Dubai Sharks Rugby Club. YR. Which rugby team do you play for? BL. I play for the Dubai Sharks RFC. YR. What position do you play? BL. I’m currently playing loose-head prop, but I personally prefer to play tight-head prop. YR. How long have you been in Dubai? BL. I’ve only been playing rugby for the Sharks for two months now as I’m still new to life in Dubai. YR. Which country did you come from and how does playing rugby here in the UAE differ from your home country? BL. I came from France, my home country. The cultural diversity brings a lot of differences on the pitch. Compared to France, the game is really fast, always playing out wide, which is not really the kind of rugby we play in France. The rugby game is just crazy over here, it’s intense and exciting. Rugby in France is much slower, it’s more physical than technical, and forwards keep the ball a lot more. At the moment I think French rugby is old fashioned. You just need to look at the French performances in the rescent Rugby World Cup to see the proof. So it’s amazing and positive for me to learn to play with this international culture. Especially for a prop, because we are not used to playing with such ‘mobile’ and fit props in France, so I it is a great opportunity to learn with other players from all over the world. YR. How many years have you been playing rugby? BL. I used to play when I was younger, but I had to stop because of an injury. I came back to playing rugby two years ago where I played for my University in France. YR. What made you choose your current rugby club? BL. Actually, I was really lucky to find the Dubai Sharks. Before coming to Dubai, I knew that I wanted to play rugby and continue playing the sport that I love. So I tried to contact the different teams I found on Facebook, and the only reply I got was from the Dubai Sharks. They were quick to respond, and I had many questions which they were able to answer very easily. Then, 3 days after arriving in Dubai, I was able to come to my first training session. It was amazing because I didn’t know anybody in Dubai and as soon as I arrived, I was welcomed into the club like it was my family. YR. What has been your favourite memory so far playing rugby here in the Gulf? BL. I would have to say my first game. It was amazing because I was really feeling part of a team, and it’s an indescribable feeling, the first time you share a rugby match with your team mates, you only get this feelings playing in team sports. So being back in a rugby team is amazing, and my first game is a great memory for me. YR. What has been your worst memory playing rugby here? BL. Definitely my concussion. It was my first one. I was in the starting XV for the 2nd team and I was so up for the game and I just wanted to play the full 80 minutes. After 10 minutes, I was knocked out in a ruck, and I just remember a few minutes later being on the side of the pitch, I was a bit lost and dazed. It’s my worst memory because I was sad and angry to have to stop playing the game, but also the frustration of having to stop for two weeks while I recover as concussion must be taken seriously in rugby. YR. Which team mate would you most definitely not like to be stranded in the desert with and why? BL. I guess in the desert it would be really hard to get food… so I would say Armel van Erck, we would have too many arguments about food and who is eating what as we’re both front row forwards and both love a good feed!! YR. Finally, what makes playing rugby so special here in Dubai and for the Sharks? BL. The first shock for me was the heat and humidity. Then, obviously, due to the weather, you don’t have mud on the pitch, which is better because at least the game is quick flowing and not stopped by the muddy pitch. Also the cultural diversity of the teams. You have people coming from all over the world, which makes new friendships so much stronger as you wouldn’t usually get the chance to meet them as easily as being back home in France. Everybody is also out here to work or to travel so we all share the same experiences. https://www.yallarugby.com/wp-content/uploads/2015/11/dubai-sharks-player-baptiste-liagrre-yallarugby.jpg 403 768 Yalla Rugby https://www.yallarugby.com/wp-content/uploads/2018/10/yalla-rugby-dubai-uae-2019.png Yalla Rugby2015-11-10 22:04:302018-09-17 09:41:32Dubai Sharks - Whats It Like Playing For Them? Yalla Rugby interviewed Ben Rothwell, who currently plays tight-head prop for the Dubai Wasps Rugby Club. He has been in Dubai for just over two years now, having moved here from the UK in 2013. Ben first took up rugby over 15 years ago, when he was studying at university back in 2000 and he wanted to continue his passion, so he got in touch with a few of the local rugby clubs in Dubai. The (then) chairman of Wasps Rugby Club, Craig Gibson, who Ben says, “was extremely helpful”, gave him plenty of advice and information about playing rugby in Dubai and he knew from that moment that he wanted to play for the Wasps. We asked Ben what his favourite memory so far has been as a Wasps player, playing rugby here in the UAE? And his worst memory playing for the Dubai Wasps? Spending a lot of time with your teammates is important for building up comradely and lasting friendships on and off the pitch. So we asked Ben, which teammate he would most definitely not like to be stranded in the desert with and why? Want to play for The Dubai Wasps? We’d like to thank Ben for giving us this brief insight into playing rugby in the UAE. If you are interested in letting us know your UAE rugby experiences, please get in touch at info[at]yallarugby.com. If you are interested in joining the Dubai Wasps Rugby Club, Ben highly recommends speaking with their current Chairman, Laurence Parker, Aaron Lewis or Pete Scargill. Visit the Dubai Wasps club page here. One of the many benefits of playing rugby in Dubai, is that there are players looking to help raise awareness and promote our sport throughout various parts of the world. One such player, Danny Thomas, a member of the Dubai Wasps 1st XV team, will be visiting Tanzania as part of an organised school trip in December 2015. During his visit there, he is hoping to provide children in the underprivileged areas of Tanzania some rugby kit which will assist with the Youth Athletic Programs. Many young people in Tanzania don’t have access to positive outlets such as organised sports. Giving pupils access to basic rugby equipment will help them build the confidence to develop new skills, and reinforce the principles of team building and values. We’re hoping that by publicising Danny’s forthcoming trip to Africa, he will be able to haul a huge amount of kit over to the areas of Tanzania that really need it. Should any rugby clubs in the UAE, parents or fans of the sport wish to donate sporting items, such as rugby tops, boots, balls or any other sports kit, please kindly drop him a message on Facebook or contact him via his email at danny.thomas@nasdubai.ae by Friday 4th December at the latest. A strong Lebanon 7’s team lifted the winner’s trophy in Friday’s UAE Rugby Dubai Airports International 7’s tournament, played at Dubai’s Sevens Stadium. Commenting on the tournament, Al Dhalai said, “This tournament was an effort from the newly established the Arab Ruby Federation. We were delighted to host 4 of our 9 member unions (within Arab Rugby) for the inaugural UAE Rugby Dubai Airports International 7’s tournament, and will work closely with each union for more teams to participate at what we envisage will be an annual tournament”. “Our sincere thanks goes to Dubai Airports for their support and sponsorship of both UAE Shaheen and this developmental 7’s tournament.” added Al Dhalai. “The way UAE Shaheen came together as a team against a very good side and stayed in the game right down to the end speaks volumes about how much they have improved in recent months. We are very proud of the team and the coach for all their hard work and commitment and we believe the UAE Shaheen is well on its way to becoming a side to reckon with.” said Anita Mehra, Vice President of Communications & Business Development at Dubai Airports. The annual UAE Rugby Dubai Airports International 7’s has been designed for emerging teams to participate and be exposed to an international tournament against teams of the same skill and fitness. 4 teams participated in the inaugural tournament, including Dubai Airports UAE Shaheen, KSA, Lebanon, and the first all-Qatari National team. The Arab Rugby Federation (ARF) has officially been formed following an extraordinary general meeting held in Dubai (UAE) on October 1st. The ARF has been formed to represent the Arab nations solely in the sport of Rugby, under the auspices of the Union of Arab National Olympic Committees (UANOC), with the intent to participate in regional games, which follow the pathway to World Rugby, and IOC sanctioned and recognised events. ARF’s committee was also finalised, with Morocco appointed first vice chairman, Tunisia second vice chairman (both Morocco and Tunisia hold World Rugby membership), and UAERF Board Member Mohamed Shaker appointed as Secretary General. “I’m very confident the Arab Rugby Federation will offer various development opportunities to grow the sport among the Arab nations, which at the end of the day will benefit all parties.” Shaker added. The new Federation’s formation was witnessed in the presence of 9 Arab rugby bodies; UAE, Qatar, Saudi Arabia, Lebanon, Egypt, Jordan, Libya, Tunisia and Morocco. Here’s an interesting new infographic demonstrating how the modern day rugby player differs from back in the amateur days of 1987. Props now weighing in at an average of 124kg apposed to 108kg, energy from scrums equating to pushing two double decker busses the length of the rugby pitch and being tackled these days is like a fridge being dropped on you from 2m in the air. Good to know!! !